PTE WM F HOUSTON R.E. William Fulton Houston was born on 24th July 1882 at Roseland, Erskine, Renfrewshire, the second of a family of eight born to Robert Houston and Mary Fulton, from Whithorn, Wigtownshire, who had married there on 26th June 1879. In 1881 Robert (28), Mary (23), and their first child Mary were living in 6 Willis Square, Everton, Lancashire. Robert was a warehouse foreman. They returned to Scotland before William was born, just over a year later. In 1891 the Houston family of seven was living at Mosshall, Erskine. Robert was a general labourer and the children, including William F (8), were at school if old enough. By 1901 the Houston family, now of nine, had moved to Broomward Land, Bridge of Weir. By then Robert was a foreman roadman with the County Council, William (18) was a joiner's apprentice and Helen (14) a dressmaker's apprentice. Eldest daughter Mary was no longer in the family home. In April 1911, Robert, Mary and four of their children had moved to West Kildarroch, Kirkinner, Wigtownshire where Robert had turned to farming. William (28) remained in Renfrewshire, however, and was working as a joiner and boarding with the Tod family in Ladebank Terrace, Bridge of Weir, in the same apartment as David Tod, also destined to be killed in the war. William Fulton Houston married Elizabeth Thomson McIntosh, daughter of Andrew McIntosh, a currier and leather merchant from Crosslee, Renfrewshire and Agnes Campbell, in Paisley on 14th July 1911. Their daughter Mary Fulton Houston was born in Bridge of Weir on 13th August 1912, and son Andrew McIntosh Houston on 21st June 1916. 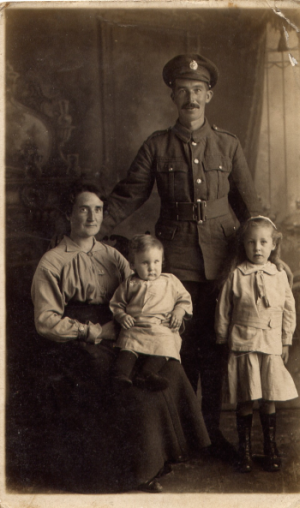 William enlisted at Paisley on 1st September 1916, initially as Regimental No. 116636 in the Royal Garrison Artillery at The Citadel, Plymouth, later transferring to the Royal Engineers, No. 224132. By the time he died he was attached to the 9th Prince of Wales's (North Staffordshire Regiment), which formed the pioneer battalion of the 37th Division, from whom he received his final number 50098. In April 1918, the 37th Division was engaged in the 1918 Battle of the Ancre , one of the final battles fought in the Somme area as the Germans advanced rapidly in a final attempt to punch through the British lines. Although they penetrated, the Allies recovered and the German offensive, also known as Operation Michael, failed. The Germans used mustard gas, which they had developed in 1917. The War Diaries of the 9th North Staffordshires describe the shelling of Fonquevillers on 11th May 1918, between 5 pm and mindnight, with some 2,000 shells, and it took some time to realise they were gas shells. The men also had difficulties wearing their box respirators. 59 men were killed by effects of the gas immediately and 140 more were taken to a Field Ambulance. William, and probably many more of the 140, finally succumbed to its effects in No. 9 U.S. Hospital in Rouen on 14th May 1918. His father Robert, a former church officer at St Machar's Church in Bridge of Weir, died at his farm in Wigtownshire less than two months later. William's wife and two young children received a pension of 25s/5d a week. UK Soldiers Died in the Great War. 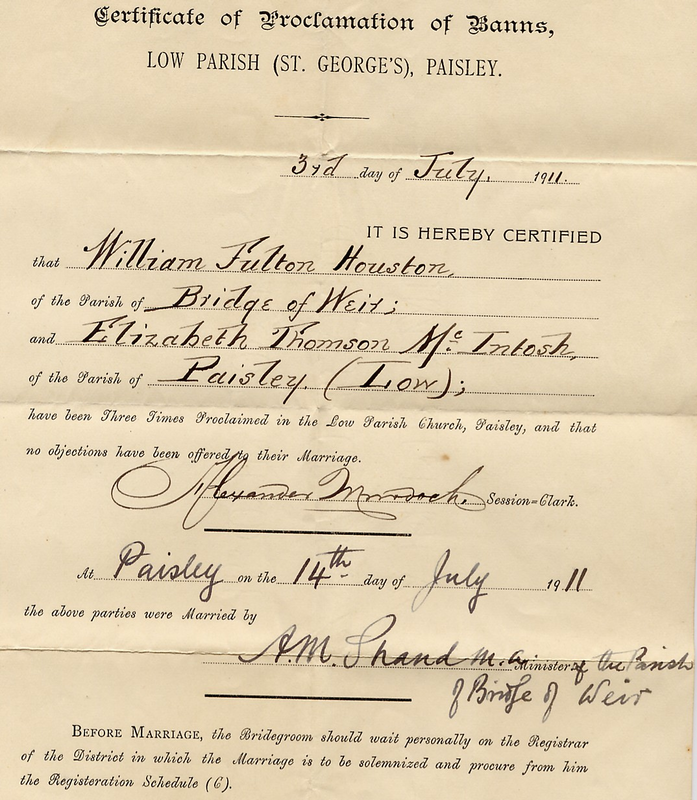 William Fulton Houston birth certificate, 24th July 1882. Regd. Erskine, Renfrewshire 26th July 1882. 1881 UK Census: Parish: Everton; Borough of Liverpool; Page:51; Schedule 241. 1891 UK Census: Parish: Erskine; ED:1; Page:25; Line:21; Roll: CSSCT1891_178. 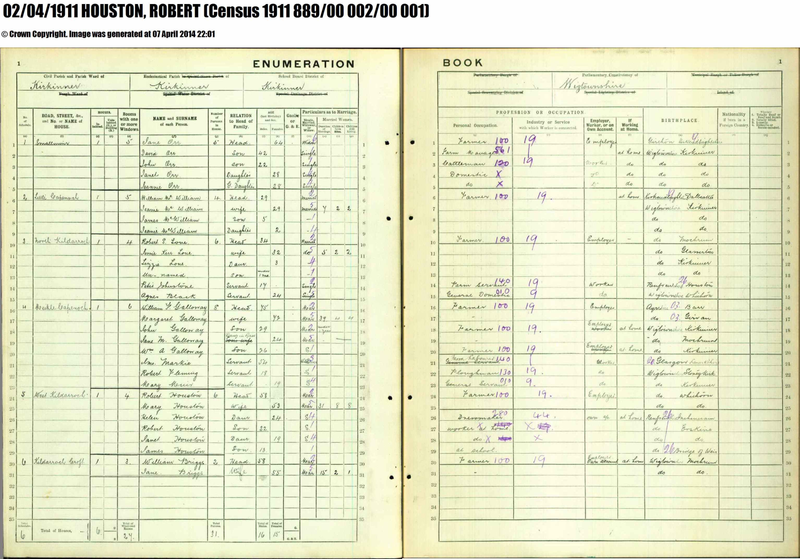 1901 UK Census: Parish: Houston; ED:1; Page: 24; Line:19; Roll: CSSCT1901_188. 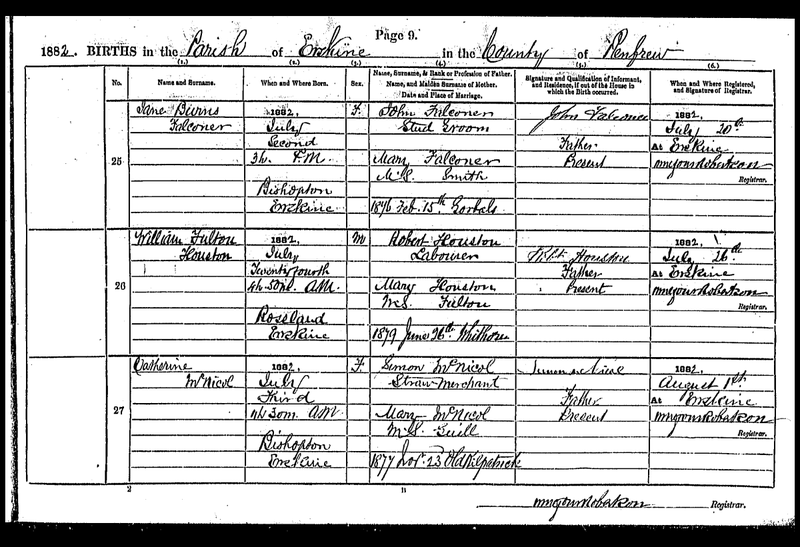 1911 UK Census: Parish: Kirkinner, Wigtownshire. Page 1 lines 24-29. 889/00 002/00 001. 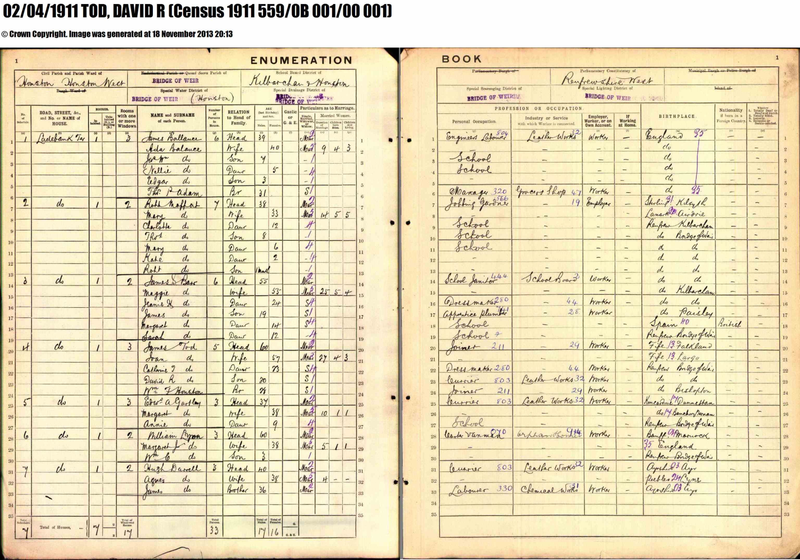 1911 UK Census: Parish: Houston West. Ward: Bridge of Weir: page 1 line 24. 559/0B 001/00 001. William Fulton Houston Army Service Record. William F Houston: correspondence and Ancestry family tree. War Diary. 9th North Staffordshire (Pioneers). 1 Aug 1915-30 Apr 1919. WO95/2524/1. National Archives. FONQUEVILLERS. 4th May 1918: 'A' Coy. same as yesterday. 'B' Coy work on roads as before. 'D' Coy same as yesterday. 6th May: Same as before. FONQUEVILLERS - LA BRAYELLE Rd., heavily shelled, party had great difficulty in keeping road in repair. 7th May: 'A' Coy work on RUSSIAN AVENUE - BADEN GRABEN. numerous falls and floods caused by weather. 'B' Coy on roads as before. 'D' Coy, working on RETTEMEY AVENUE, wiring, revetting, re-wiring also on S. side of BIEZ WOOD. 8th May: Ditto. ditto. Improving billets on LABRAYELLE Rd. 9th May: 'A' Coy, clearing out PRUSSIAN AVENUE, which had been shelled during night of 7/8. General maintenance work. 'B' Coy repairing BIENVILLERS ROAD, wiring BIEZ WOOD south side K.6.B.5.7. 'D' Coy extending KEANE TRENCH L.1.d.85.55. - L.1.d.40.40. also work on RETTEMOY AVENUE F.25.d. wiring and revetting in trench. 10th May: Same as yesterday. 11th May: Work as usual. The enemy began to shell FONQUEVILLERS about 5 p.m. For a little time it was not known that these were gas shells. About 2,000 gas shells were poured into FONQUEVILLERS & shelling ceased about 12 mid-night. During this time great difficulty was experienced in wearing the Box Respirators. 12th May: Work as usual. 13th May: 'A' Coy work on PRUSSIAN AVENUE. 'B' Coy on road work. 'D' Coy on RETTEMOY AVENUE. 14th May: Same as yesterday. Casualties. May 1918. Killed in action: 1 O.R. ; Died of wounds (shell) 1 O.R. ; Died of Wounds (Gas) 59 O.R. ; Wounded (Shell). F.A. 1 officer, 9 O.R. ; Wounded (gas) F.A. 9 officers, 131 O.R. 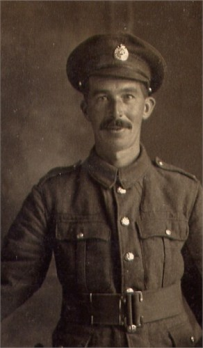 o 6th June 1918: Private Wm. Fulton Houston, North Staffords (died), husband of Mrs Houston, Sandbank [sic] Terrace, Bridge of Weir. o Houston, William Fulton; Joiner, R.E. Sapper; Ladebank Terrace; No. 9 U.S. Hospl. France; attached North Staffords. ; 14 May1918; Gassed; aged 36.
o	Houston, Robert; Farmer; Late Church Officer; Whamphill, Wigtownshire; 11 July 1918. Buried 14 July.